Address by Rt. Wor. Bro. Rabbi Dr Raymond Apple, AO RFD, Past Deputy Grand Master of the United Grand Lodge of New South Wales & the Australian Capital Territory, at the Australian Masonic Banquet, Jerusalem, 7 November, 2012. I personally have a foot in two camps as an Australian Freemason who now lives in Israel and belongs to a Jerusalem Lodge. Let me echo Scripture (I Sam. 25:6) and say, Attah shalom uvet’cha shalom v’chol asher l’cha shalom, “Peace to you, peace to your house, peace to all that you have”. One of the amazing experiences of this city is how every day – and any day – is both yesterday and today. The street names resonate with memories of ages as disparate as King David and King George. The buildings are a jumble of the Bible, the Koran, the 19th century European Christian missionaries, and the Champs Elysees. The people are mystics and moderns… sometimes rolled into one. There are believers who move sedately, lost in meditation; there are pietists who constantly scurry in search of a chance to study or to pray. There are old women who lug their heavy shopping trolleys, students with back-packs on the way to a lecture, youngsters in skimpy dress who meet their friends in an underground disco or bar. All believe that Jerusalem belongs to them. Jerusalem is an elevated site, where life is always on a high. There are high-rise apartments – and lowly caves. There are stairs too, and walls. Parts of the city have the feel of Wall Street – but the wall par excellence is the Kotel Ma’aravi, the Temple’s Western Wall that has survived the depredations of generations of the city’s conquerors. What happens at that Wall depends on who you are. To some there is sheer holiness in the air; to some it is where you excitedly encounter tour groups from all over the world; to others it is a bothersome gathering of mendicants. The attempts to clear the beggars away have not entirely succeeded: a few hardy suppliants have been seeking donations to pay for their daughter’s wedding for so long that you recall Gilbert and Sullivan’s verse, “She could very well pass for forty-five in the dark with the light behind her”. Freemasons, for whom Jerusalem and King Solomon’s Temple have such a special significance, are not the least amongst the visitors to the Wall who bring their own private prayers and requests to the ancient stones. Despite the Masonic requirement that members of the craft believe in God and the fact that every Lodge meeting place honour the Volume of the Sacred Law and the name of God, some Masons are not particularly certain about what the word “God” means to them. But every true Mason – whether they have what the Hebrew calls gadlut emunah or katnut emunah, “greatness of faith” and “littleness of faith” – senses the Divine Presence in this place. 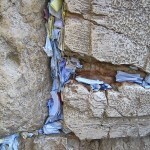 It is customary for a worshipper to place a little folded scrap of paper in the Wall’s crevices. Popes and presidents, politicians, priests and poets; athletes, actors and artists; people of all creeds, colours and cultures – all leave their prayers behind. Thousands of ordinary Jerusalemites too, who flock here on high days, holy days, weekdays or whenever, never leaving the Wall unattended even in the depths of the night. The little scraps of paper or parchment are called in Yiddish k’vitlach or tzettlach. In Hebrew they are pitka’ot. They are not so much written with ink as with tears. Surely God reads them. If Superman has X-ray vision, all the more so does the Almighty. It doesn’t matter if once in a while the notes are collected and given reverent burial. The message has already been heeded; whatever the answer, the person whose heart was poured into the petition already feels better. What the messages are about is presumably health, happiness, serenity, success, good marriages, good children and family stability. World peace certainly figures very prominently. I know what I hope for; I can guess what you do. But we’ll come to that aspect in a moment. First let’s ask when and where the k’vitlach custom arose, and the answer is that probably no-one knows for certain. I recall hearing that in the 18th century Rabbi Chayyim ibn Attar of Morocco, author of a famous commentary called Or HaChayyim, who died in Jerusalem in 1743, learnt that his disciple, Chayyim Yosef David Azulai, later known as the Chida, was planning to live in Israel, and he asked him to place a letter in the stones of the Wall. Azulai agreed but it slipped his memory. Only when life in the Holy Land was proving too difficult did he recall his mission. He went to the Wall and deposited the note there. Someone who saw this happening extricated the note and read it. It was a plea to God to grant success to Azulai, whom it described as a great Talmudic scholar. This alerted the sages of Jerusalem to the qualities of Azulai and they appointed him as their leader. There are many more tales about the life and deeds of Azulai. Who knows which ones are embroidery or embellishments? Another version of the story (recorded in somewhat different form in Sha’ul Schaffer’s book Israel’s Temple Mount, 1975, page 163) says that when Attar gave a note to a poor man who needed help, the recipient meant to place it in a crack of the wall but the wind blew it away and someone read it and was able to arrange support for him. These stories all seem to recognise that three centuries ago it was already considered efficacious to put notes in the wall. There may be published research on the subject but I have not yet come across it. 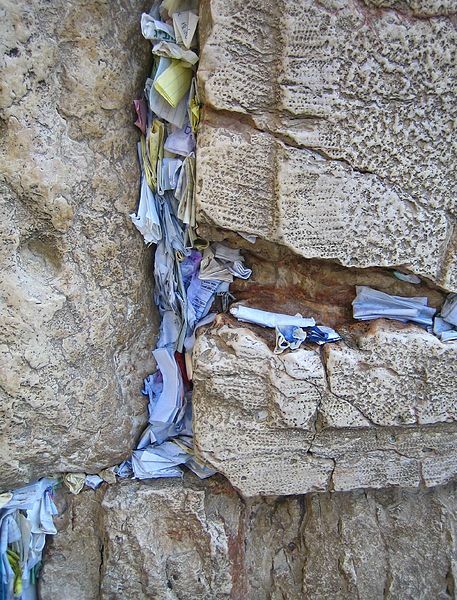 In the meantime the notes in the wall express the outpourings of innumerable hearts and acknowledge the tradition that the Divine Presence has never left the sacred site where once the Holy Temple stood. Of course the construction of King Solomon’s Temple plays a central role in Masonic literature and ritual, though much of the Masonic material is rather legendary, such as the belief that Solomon was the first Grand Master of the movement and that stones from Zedekiah’s Cave were used for his Temple. Possibly Herod used these stones for his Temple a thousand years later; some might have been incorporated in the old clock tower above the Jaffa Gate; some probably were utilised for the YMCA building. Actual Masonic Lodges did not begin in Jerusalem until 1868, despite the claim that this is the cradle of the craft. There is an excellent book in Hebrew by a distinguished Brother, Leon Zeldis, entitled B’nei Or B’Eretz HaKodesh, Sons of Light in the Holy Land. I don’t know whether you have yet been to the Western Wall. Maybe you have. If not, place k’vitlach there by all means, but don’t expect God to do all the work. Ask Him for things that you are unable to do or to help to achieve on your own. Ask Him for the wisdom and strength to use every ounce of ability that you already have in order to attain the ideal you yearn for. What do I say in my own notes in the Wall? I must admit that I don’t usually place notes there. I stand in a quiet corner and think. I think about what really matters in my life. I more or less sort myself out. I examine my priorities. I think through what I could achieve if only I utilised whatever combination of abilities God has given me. I know someone told my wife recently that I was famous. Whether that’s true or not, I place no store on vanity or fame any more. I am more concerned to do what the Biblical prophet calls ze’er sham, ze’er sham – “a little bit here, a little bit there” (Isa. 28:10), to help my family and arouse human minds and hearts. Now I am retired, I spend much of my time at my desk, thinking, researching, writing. I find that words come easily to me. What I pray for is that my words may make a difference. What you pray for is a reflection of who you are. If you want to put a note in the Wall, so be it. But don’t leave it all to God. To ask for Him to do all the work is to abdicate. As Rav Kook says, it also diminishes the One who created so much talent in each of His creatures. At the same time, don’t try to do everything yourself and leave nothing to Him. That’s nothing but arrogance. You can’t do it all yourself without His help. I have a suggestion for my Masonic brethren. Physically or allegorically, place notes in the crevices of the Wall. On them write the headlines of the Masonic moral philosophy. Ask God to bless and uphold our moral principles, brotherliness, truth, justice, harmony, benevolence. Some people will snort, “But these are just ‘Motherhood’ tenets – lovely theory, but they don’t change a thing!” Bernard Shaw says that if anyone complains that lists of principles are only on paper, remember that it’s only on paper that eternal peace and other blessings have ever been achieved. “Motherhood” principles should never be knocked. We Freemasons know two things about them: firstly, that there are times when it’s already a moral victory to remain true to our theories, and secondly: that every opportunity should be taken to turn our theories into facts on the ground. So now comes suggestion number two: physically or allegorically, write tasks not so much in but on the walls of wherever we live. We don’t need to do over-ambitious or hi-falutin things, but we can and must affect our microcosm. Whatever needs doing to create good citizenship in our immediate environment, starting within our own families, Lodges, and associations, and moving outwards into our neighbourhoods and nations – let’s commit ourselves to and enlist others in the task. Areas of activity? Try civility, cleanliness, decency, ecology, employment, generosity, helpfulness, honesty, hospitality, justice, literacy, safety, thrift – and above all, tolerance and non-extremism. It’s a project which Freemasons everywhere might pioneer, one more Masonic contribution towards raising the quality of community and society. It’s a project that might be specially addressed to people like me: we need to find retirees, and harness their talents and experience for the benefit of society as a whole. An American Jewish thinker, Irving (“Yitz”) Greenberg, says that after Auschwitz we have to speak of “moment faiths” – momentary glimpses of redemptive vision – in contradistinction to times when we see “flames and smoke of burning children” (in Auschwitz: Beginning of a New Era, ed. Eva Fleischner, 1977, p. 27). There is much that can be said about this dichotomy, but let us apply it in our micro-sphere by remarking that we Freemasons will have done well if we can increase the moments of redemptive vision and action and reduce the times of flames and smoke. Jerusalem leaves memories in the minds of all who come to visit. Thank you for coming; take away the memories, remember the message of the k’vitlach, and let everything you have seen and heard here inspire you to a new commitment to moments of service to mankind. For more articles on Freemasonic issues by Rt. Wor. Bro. Rabbi Dr Raymond Apple, AO RFD, visit his Freemasonry webpage. Rt. Wor. Bro. Rabbi Dr Raymond Apple’s book on the history, symbolism and teachings of Freemasonry, enlivened with personal reminiscences and humour. Order the paperback or Kindle edition from Amazon or the paperback from The Book Depository to receive free shipping. Selections from the book can be previewed on Google Books. This entry is filed under Articles, Freemasonry, Israel.